Gentleness is a defining term often used to describe how a Christian woman should behave, but do we really understand what it actually means to produce this fruit of the Spirit? 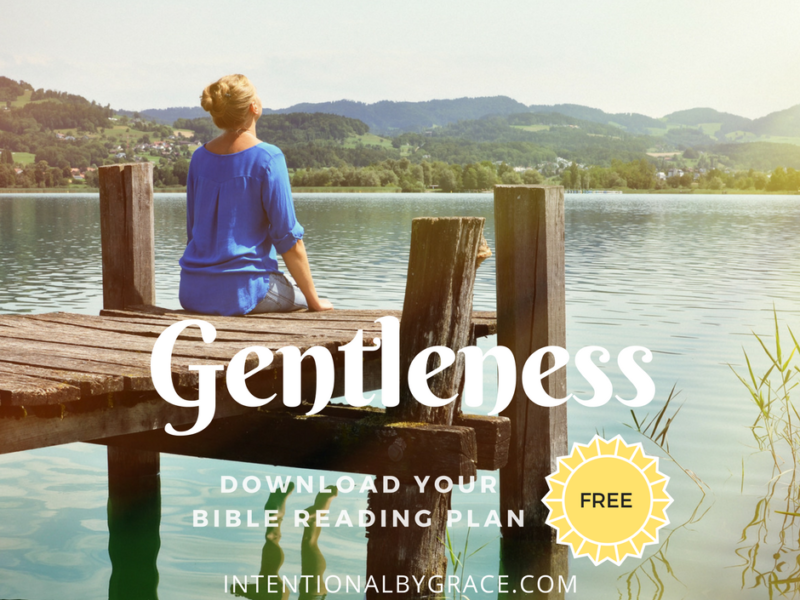 Download this FREE topical Bible reading plan and spend 21 days meditating on Gentleness! This is one of the fruits of the Spirit that has always been difficult for me to grasp, let alone put into practice in my own life. I was raised to be a strong woman. A woman who speaks her mind, has her way, and needs no one to approve of her. Something happens that never ceases to amaze me. Gentleness is a fruit of the Spirit. It is a character trait that should be cultivated. Buuut what is Gentleness, Really? That’s what this topical Bible reading plan is all about. With the help my assistant, Ashley, we’ve compiled 21 verses that focus on who God is, what He has accomplished through Christ, and what He wants to do through you as you move in gentleness towards others. This 21-Day topical Bible Reading Plan will guide you through various Scriptures that are all tied to understanding and growing in Gentleness. 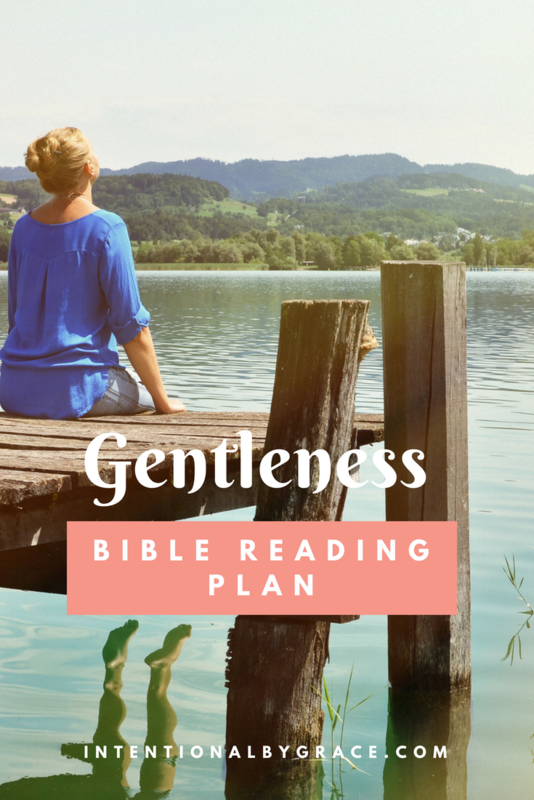 To download your FREE Gentleness Bible Reading Plan, enter your email address below and we’ll send it right over. Plus you’ll receive access to ALL of our subscriber FREEBIES (which is proving to be quite the selection!). 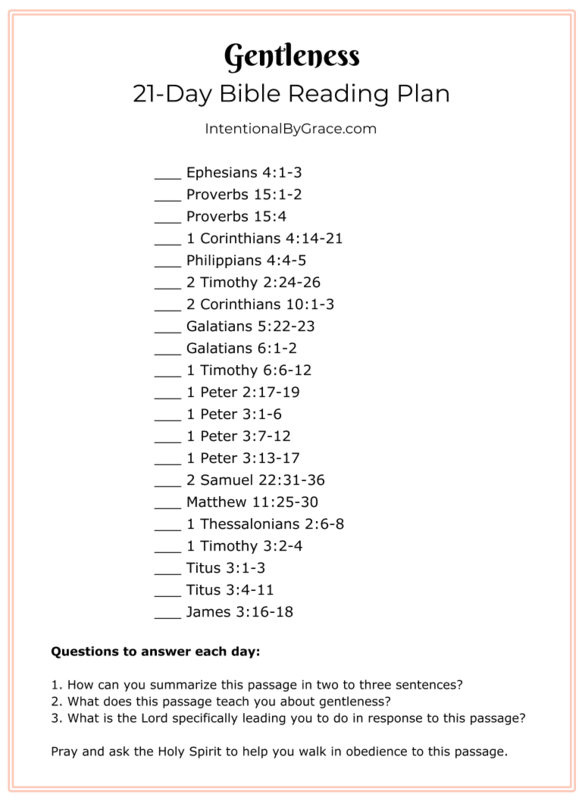 If you’re interested, we have created a companion JOURNAL to go with this Bible reading plan! This beautiful printable journal is meant to guide you through the 21-day Bible reading plan. It gives you question prompts and space to journal your own thoughts as you read and meditate on what God’s Word says about gentleness. The plan is FREE, but you can find the Companion Journal in the Intentional by Grace store. 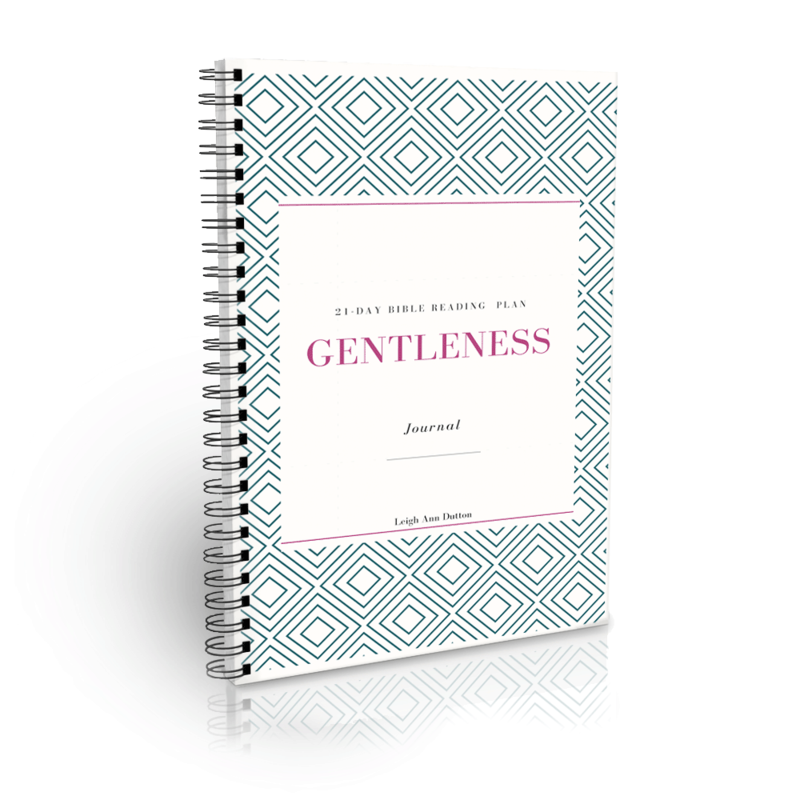 Click HERE to checkout the Gentleness Companion Journal. Our Bible Reading Plans are just 21 days long. This way you don’t have to worry about “getting behind” if you’re working through one Bible reading plan a month. You can work at your own pace and go deeper into each area of text if you desire. Plus, there are no dates or days marked on the plans. This means you can skip around and read the passages in any order you like, at any time of year you like. 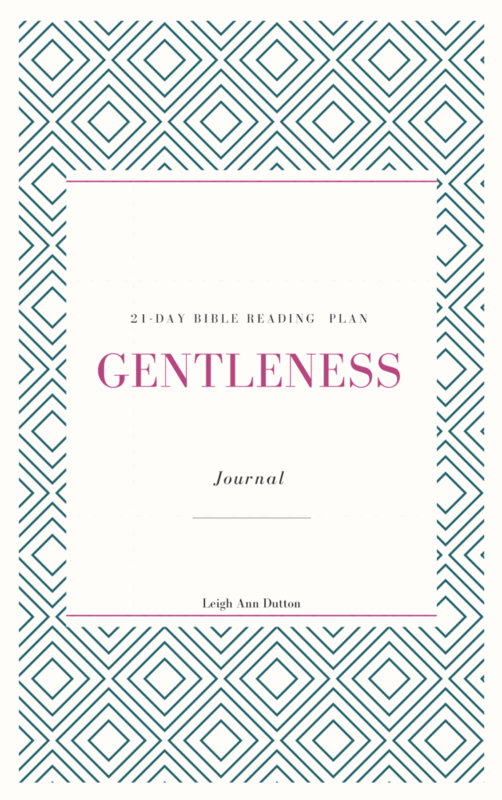 We are praying this Bible reading plan and journal companion will help you have a special place to record your thoughts as you quiet your heart and mind to read God’s Word and growing in gentleness. 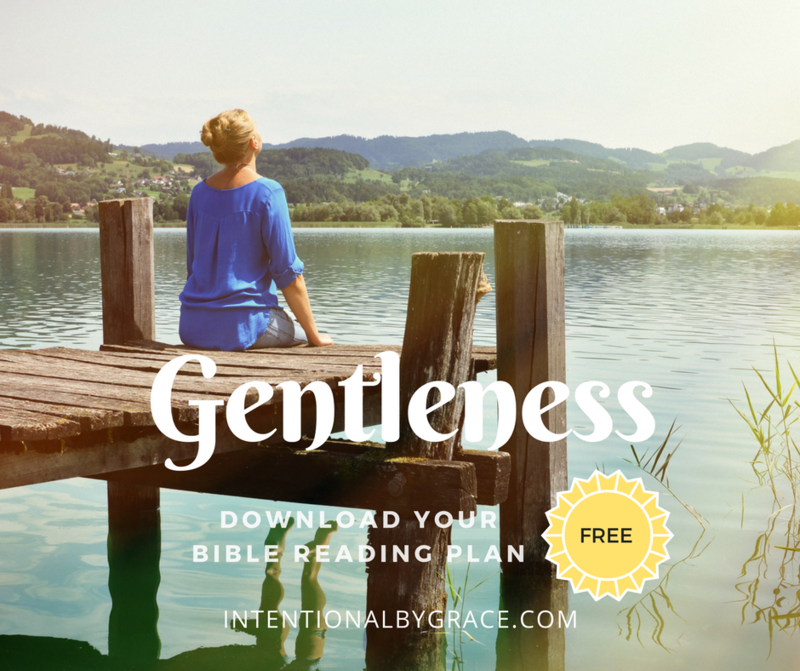 To download your FREE Gentleness Bible Reading Plan, enter your email address below and we’ll send it right over. If you want to grab your Companion Journal to go with the free Bible Reading Plan, then click here to head over to the Intentional By Grace Store to get your copy today. We pray this Bible Reading Plan blesses you and encourages you to dive deeper into various areas of study for His glory. 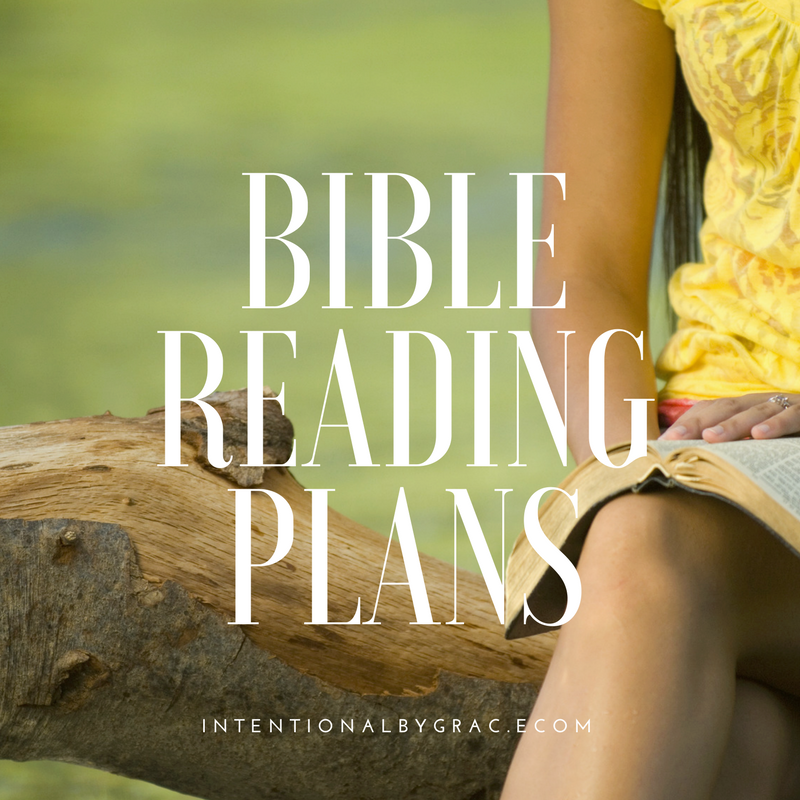 To check out all of our other Bible reading plans, click here.